Sergio Marchionne was gruff and he was tough. And he did not suffer fools gladly, including myself, as l worked for him at his private think tank, The Council for US and Italy, where the elite of the Trans-Atlantic business community met yearly in Venice or Washington DC/New York. But behind his black sweater, his checkered shirts and his perpetual Muratti cigarette smoke at the reach of his bodyguard, lived a man who was always “ahead of the curve” in political, social and economic playing fields and profoundly attuned to the times. For a decade, building on the legacy of David Rockefeller and Gianni Agnelli—the legendary patriarch of the Fiat empire—Marchionne transformed the Council into a radar for hard and soft landings of the economy and an incubator for the leadership in all fields —through a Young Leaders program that produced CEOs, startup artists, presidents, prime ministers, cabinet members, ambassadors, academics, media stars and leaders of civil society who form heart of a meritocratic group of 800 alumni. Dennis Redmont makes a joke to lighten the atmosphere during a break at the annual workshop meeting in Venice. It was at the Council workshops that we heard for the first time and years ahead, about 3D printing, industry 4.0, cybersecurity, bots or artificial intelligence before they became buzz words … or heard forecasts of unthinkable Brexit or the rush of millions of Africans to the coast of Europe. And even a Trump presidency when it was unthinkable. And a forecast of an economic boom (and possible future bust) for a few years after that surprise election result. 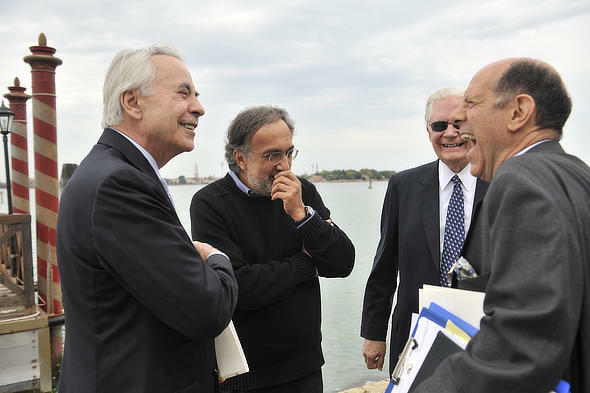 Dennis Redmont makes a point with Sergio Marchionne and then Foreign Minister and future Italian Prime Minister Paolo Gentiloni in Venice two years ago at the Council workshop. These predictions by leading thinkers and influencers kept business leaders on both sides of the Atlantic focused on their goals and gave them an opportunity to meet Joe Biden, Newt Gingrich, Bill Kristol, Federica Mogherini and dozens of others before they attained positions of responsibility. 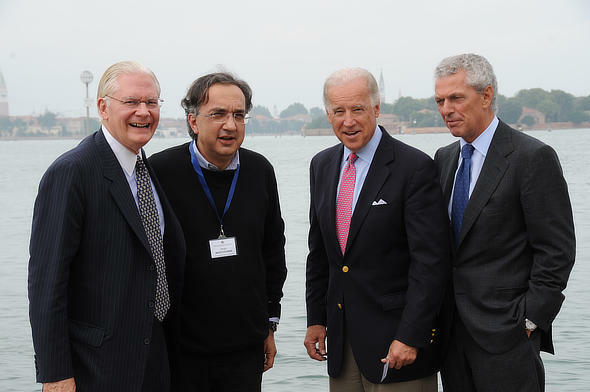 Sergio Marchionne, Marco Tronchetti Provera, David Heleniak (CONSIUSA former US president) with Joe Biden at the CONSIUSA annual workshop in Venice. It was in elegant Venice a few years ago when companies were still struggling with the economic downturn that Marchionne said “you can never grow unless you borrow. Borrow, borrow.” And that is what he did to grow the Fiat/Chrysler empire and glamorous Ferrari besides Fiat’s agricultural tractor business CNH. In fact, he borrowed from Obama who took the Automobile industry off crutches in 2009 and thrived under Trump who singled him out as his own type of guy in a recent meeting of automakers. A few weeks before his death, John Elkann, the heir to the Agnelli Empire, symbolically gifted him with a tie to mark the end of debt for the company, a promise that he kept after 14 years at the helm of the company. He also built a tremendous amount of value for FCA stock holders. People always asked me how l would define Marchionne and l tried to explain that he had deep Italian roots, having been raised by a father who was from the Carabinieri, the most trustworthy police/army corps in Italy. Marchionne’s last public act was to loan the Italian Carabinieri Corps the first Jeep of many to upgrade the mobility at the country’s most trusted institution. At the ceremony, he was slightly emotional as he remembered the virtues of hard work and honesty and his modest origins in the Abruzzi mountains. Marchionne emigrated to Canada with his family and lived on the other side of the Great Lakes, returning then to Switzerland to launch his financial career. His dress mirrored Canadian informality with loafer moccasins and dark slacks. While in Canada he gazed across the Lakes to his future home in Detroit and in the United States and often recalled this. At age 16, his dad gifted him a Fiat 124 Coupe. His time at the Council was very precious but he never allowed business to interfere even at the height of the crises. He rarely walked out of the Council meeting as long as the content was brilliant and he could also offer pithy comments about where the world was headed. Behind closed doors he tangled with the austere Mario Monti for EU Commissioner and Italy’s ex-Prime Minister over the lack of accountability of the Brussels bureaucracy which created a huge disconnect between the idea of Europe and its implementation for its main street population. In effect, this was an accusation of elitism, the issue of the year 2016, raised much before by Marchionne. In a Council meeting at Venice a year ago, Marchionne acknowledged ‘’a difficult discussion’’ (translation for shouting match) between the two sides of the Atlantic after an American Republican warned that if the Europeans did not listen to the United States they would be left behind. ‘’Part of civil society wants to bridge our societies, embracing technology and going forward in both economic and social development. Our group strongly believes in that’’, Marchionne said. It was also at the Council in New York in a discrete meeting with a woman president that he decided to break with the powerful association of Italian industry, Confindustria, which no one had dared before exit. Today many other Italian companies have left and the current president recognizes that Marchionne was prophetic. And it was also at the Council that he fulminated that he would conduct full frontal battle against the Italian labor unions, which had sapped Italy of its vibrancy and creativity. 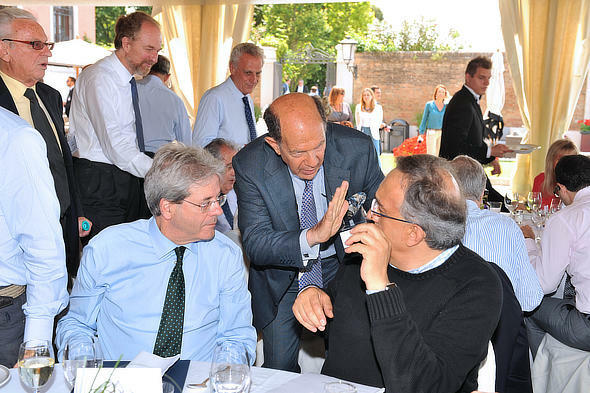 Even when Italy’s business community was shy about the uncertainty of the future government coalition and the stagnant economy, he bluntly warned that Italy might soon catch a disease called “Venezuela”. And in his factories, he forged ahead with radical transformations and some new secret production tweaks that will only be unveiled in a few years. Many of the new engineers on the assembly line were women raised in the digital age, who Sergio fiercely believed in. These engineers now worked inside a glass house in the middle of the assembly line bringing transparency instead of some remote bunker inside the factory as in the old days of the Torino based Fiat (Fabbrica Italiana Automobili Torino … were what the initials stood for – Italian Automobile Factory, Turin). Marchionne’s Dream was to boost the whole of Italian industry by inviting the business elite of the Council to the birthplace of FERRARI, in Maranello and begin to rebuild the reputation of the entire “made in Italy” industry, behind the turbo that was FCA. This was his next stage of his life and he was on the way to achieving it. But his untimely death removes him from the helm. Whether the transatlantic business elite have the fuel to roar from the rear depends very much on how much they follow in the footsteps of Sergio’s loafers. By Dennis Redmont, currently Head of Communication, Media and Development at the Council for US and Italy, served as a foreign correspondent for 40 years.